CRM metrics can give you valuable insights into the sales process and the customer experience – but if you don’t define what your business is trying to accomplish first, these metrics become meaningless. 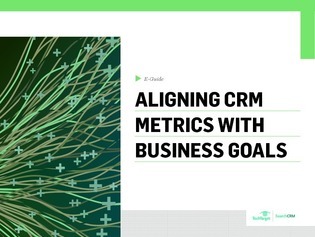 This exclusive e-guide unveils the latest best practices for aligning CRM metrics with business goals. You’ll learn expert tips on leveraging metrics for Salesforce and the call center, as well as uncover the importance of keeping metrics to a minimum.